Image: Evangeline Adams February 8, 1868 8:30 am LMT Jersey city, New Jersey; please enlarge to read a few basic chart factors messily penned on. Above you see the natal horoscope of famed American astrologer Evangeline Smith Adams. However, its accuracy is in question with a Rodden Rating of DD for ‘Dirty Data’ yet it is the data she herself gave in her book, The Bowl of Heaven and has been used by many astrologers through the years. 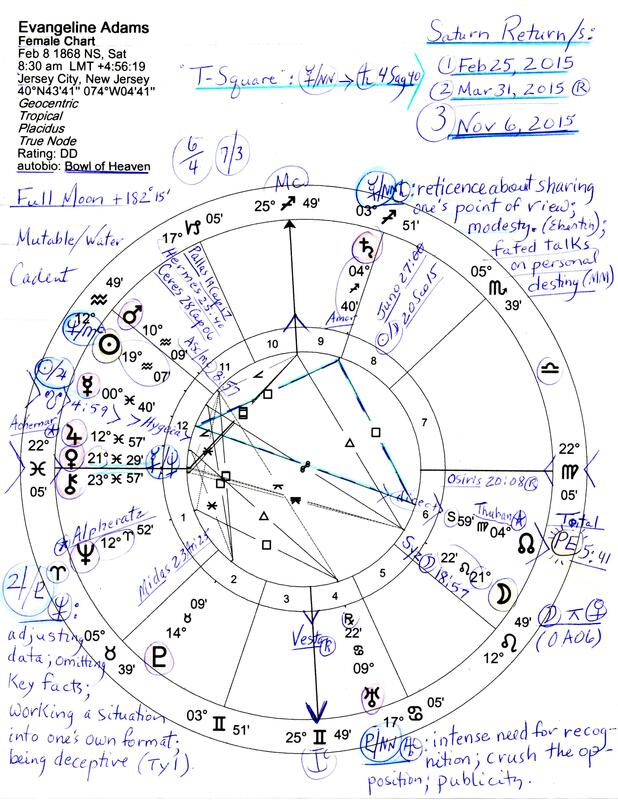 Since one of the books I am currently reading is Foreseeing the Future: Evangeline Adams and Astrology in America by Karen Christino, I naturally wanted a look at her natal chart and noticed that Evangeline Adams is in process of a Saturn Return! And with Saturn being the traditional ruler of the ancient art of Astrology, I wanted to post her chart as a tribute to her pioneering work of the 19th century when she reportedly served a client list of 100,000! Adams established herself as an independent woman of business when that sort of thing was very rarely done. And even non-astrologers have heard the tale of one of her most famous clients (and students), J. P. Morgan, and his revealing quote that, “Millionaires don’t use Astrology, billionaires do.” One must assume that this remains the case for both Financial Markets and Astrology are based on cycles within cycles so why not pay heed to the excellent timing advantage one has through the use of astrological principles? 3. November 6, 2015 which is yet to come as of this posting. Now her Mercury-North Node opposition denotes her Mercury conjunct South Node (ideas before her time; others pilfer and use her ideas without giving her credit) and the opposition points toward her natal Saturn in the 9th house of Philosophy, Religion, Higher Education, and Foreign Lands. Legal Matters may also be found in the 9th house expecially involving Higher Courts such as SCOTUS. So! Will the 2015 Saturn Return of Evangeline Adams affect current events (beyond this post!) in a karmic way? Perhaps not. But now that her chart and Return dates are noted and spotlighted we’ll have to see if the famous 19th century prognosticator of cycles somehow imprints upon current events once again. For details on the life of Evangeline Adams astro.com is recommended.